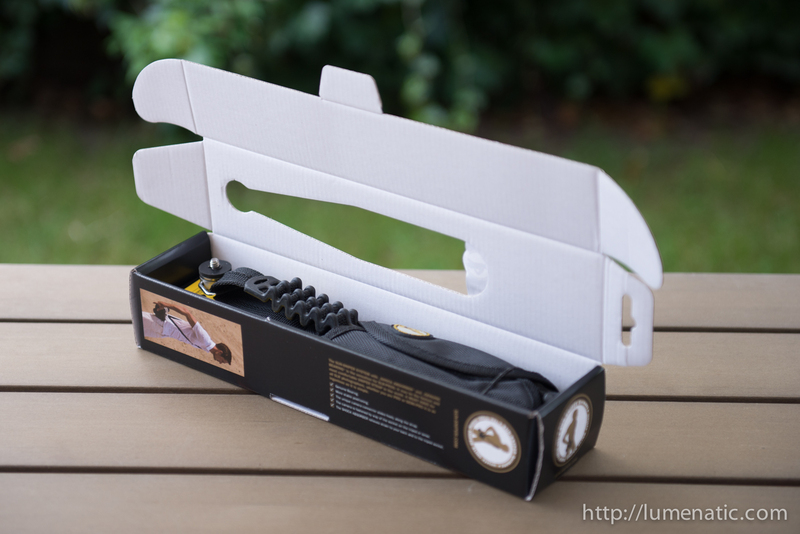 Every camera comes with a branded camera strap which is worn around the neck. Besides from being bad for your neck muscles the original camera straps are printed with a large design stating the camera brand and model name. 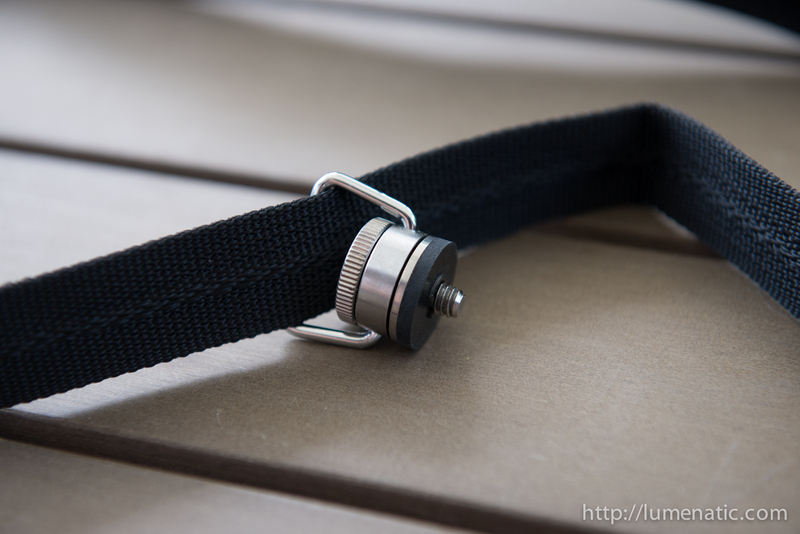 Because many people find these original straps not very attractive there is a huge market for alternative camera straps. 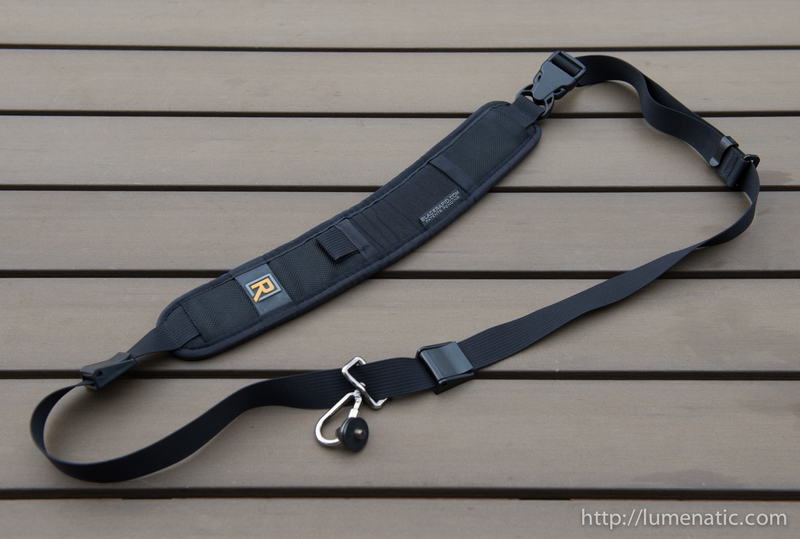 Today I want to present two popular third-party camera straps, the Blackrapid R-Strap and the Sun Sniper Pro II. 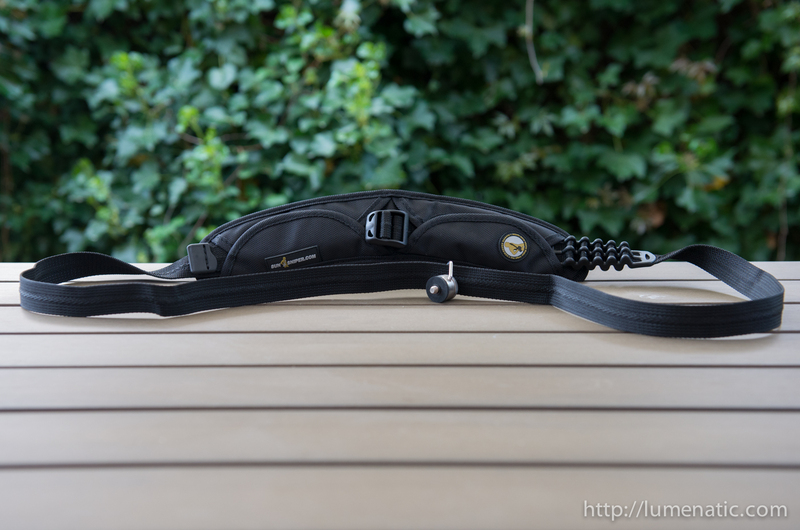 I am using the Blackrapid R-Strap for quite a while now. But since I have two cameras and sometimes carry both with me I got the Sun Sniper too. 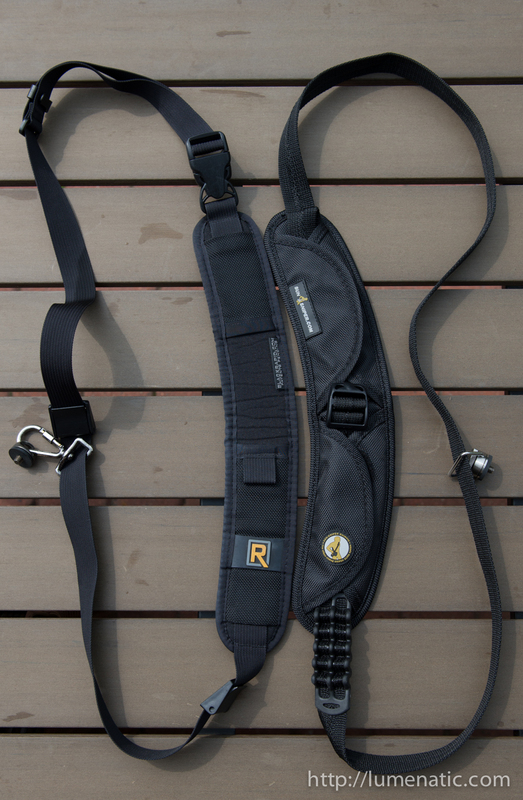 The Blackrapid R-Strap is shown on the left, the Sun Sniper on the right. Both models are worn around the shoulder and offer a broad padded section which distributes the weight of the camera comfortably. The padding of the Sun Sniper can be taken off, the padding of the Blackrapid is fixed. 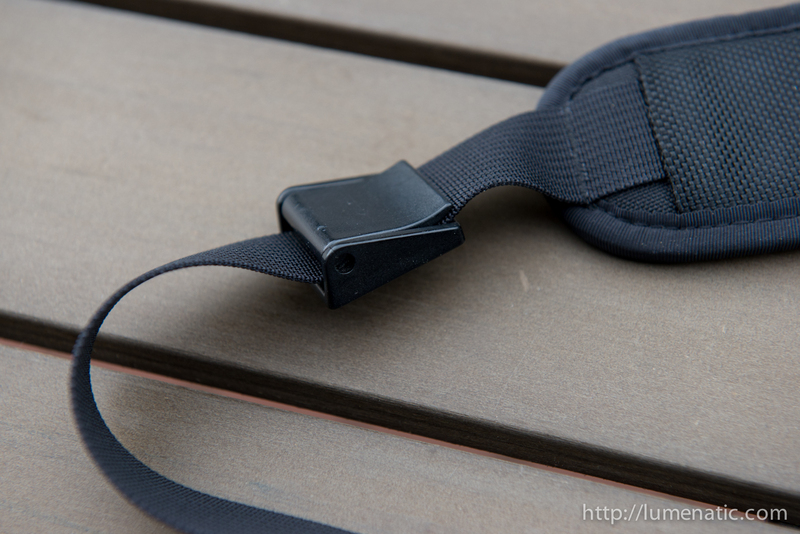 When worn around the shoulder the camera dangles at your side, fastened with a metal loop which slides on the strap. To use the camera you raise it to eye-level without taking off the strap. The metal loop slides upwards with the camera. After you finish shooting, the camera slides back down. It is a simple, but effective concept. 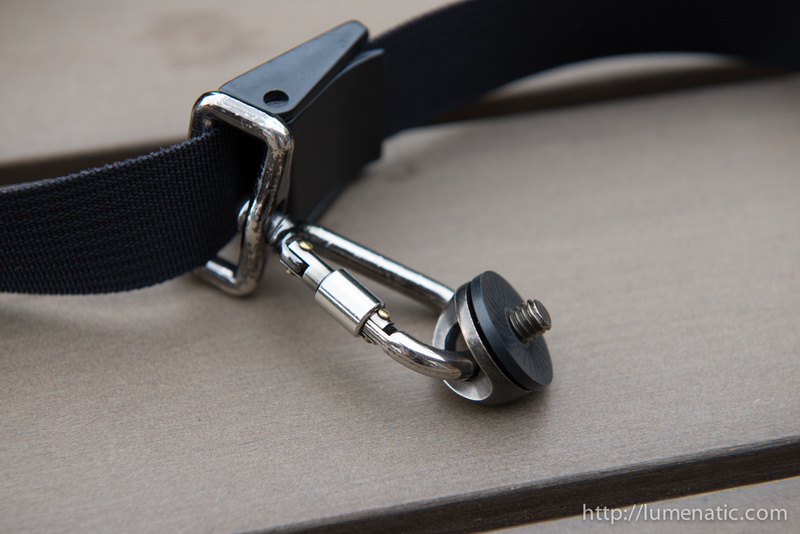 Both straps are made of a durable narrow woven Nylon fabric, quite tough material. 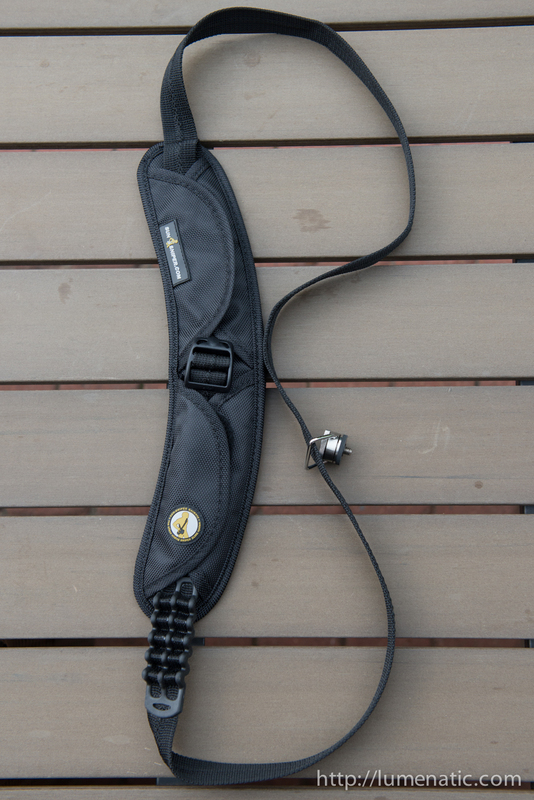 The length of the strap is adjustable to fit the photographer’s height and camera carrying preferences. 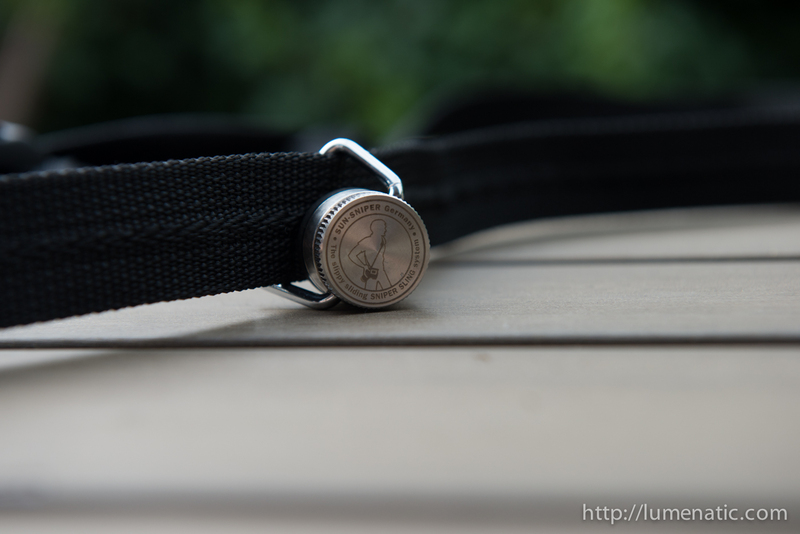 The Sun Sniper also sports a steel wire which is woven into the strap. The wire is a cutting barrier and shall prevent thieves from cutting the camera off your shoulder. 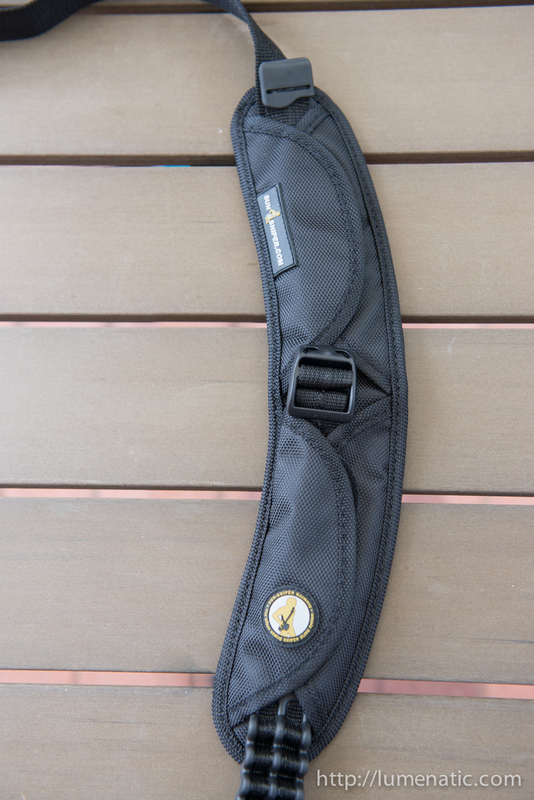 The guys at Sun Sniper are so convinced of their product that there is a free insurance with every strap. 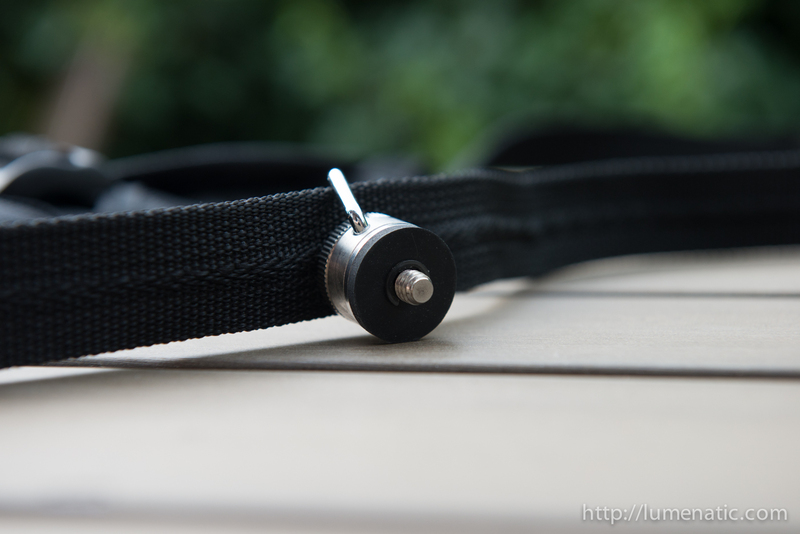 If the strap gets cut by a thief and your camera stolen because of that you get 1.000 €. Besides from being very tough the steel wire is very thin and flexible, you won’t notice it if you don’t know it’s there. The fastening system on the Blackrapid consists of a carbine hook which slides on the strap by means of a metal loop. The carbine attaches to a small metal connector which is screwed into the camera’s tripod mount. The carbine itself is secured by a locking mechanism to avoid accidental release of the camera. 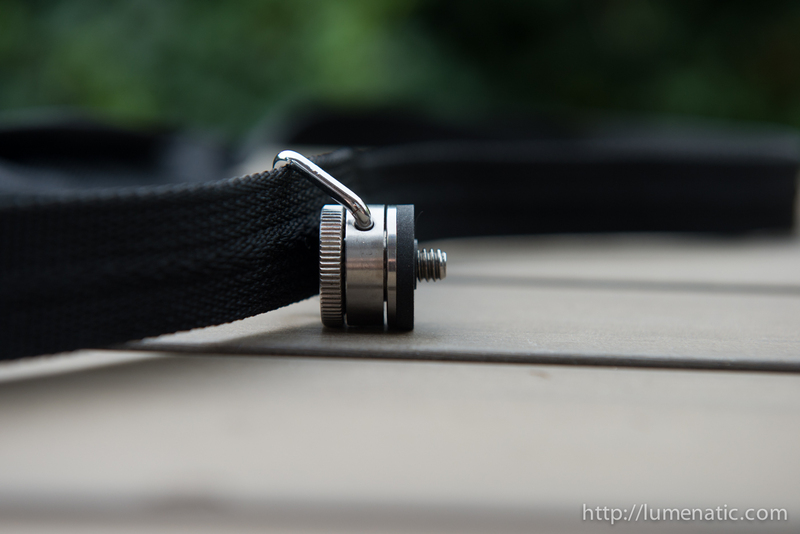 The fastening system on the Sun Sniper also includes a metal loop which slides on the strap, but there is no carbine hook. The connector piece is screwed directly into the camera. To ensure free rotation of the camera the connector piece is outfitted with a metal ball bearing (marketed as a “genuine bearing” – good to know it’s not a fake one…). The Blackrapid offers a plastic fast connector system to open and close the loop. To be honest, I never used that. If I want to take the strap off I just pull it over my head. 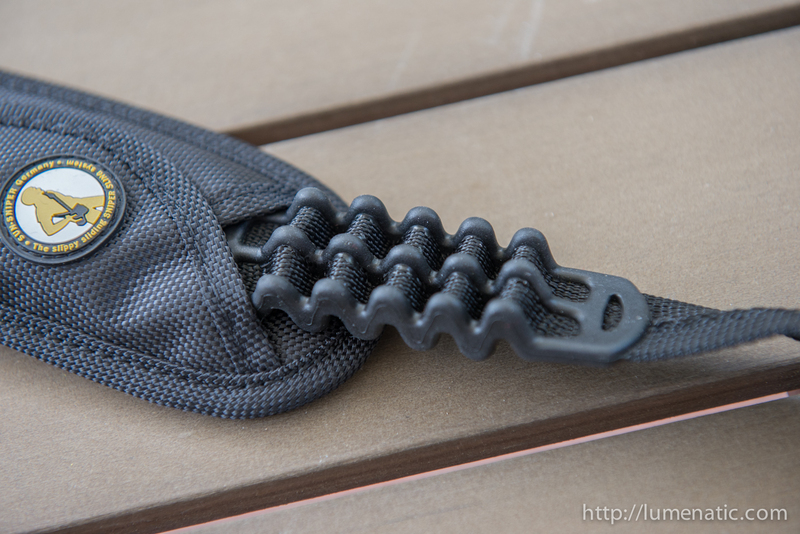 The Sun Sniper has two pairs of velcro flaps on the top side of the padded section. Between these two pairs the length adjustment piece can be locked. 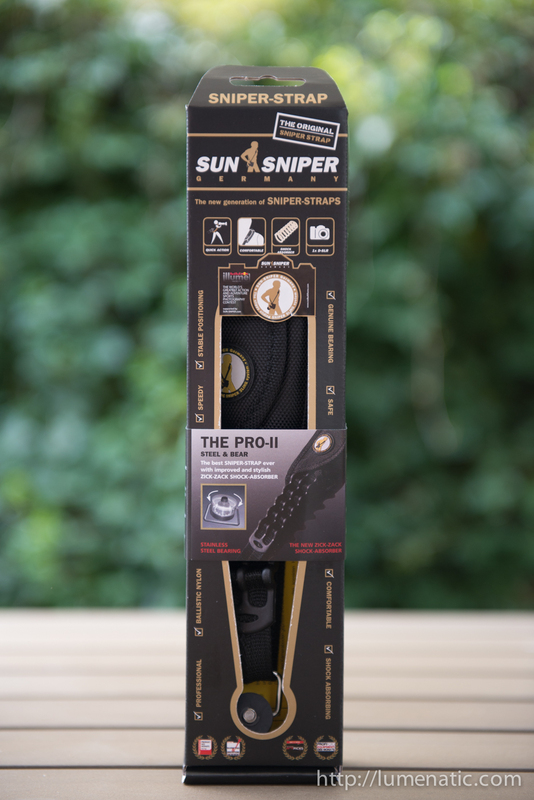 As an innovative feature the Sun Sniper Pro II has a shock absorber system. A section of the strap has been laid in a zigzag-pattern and vulcanized with rubber. This structure is supposed to act as a dampening element so minimize camera movement when you are walking or riding a bike. To be honest again – that’s nice, but I think it’s more a feature from the realm of marketing. Yes, of course the construction looks neat and from a mechanical point of view represents a shock absorber. But I doubt that it adds to the carrying comfort in a noticeable way. 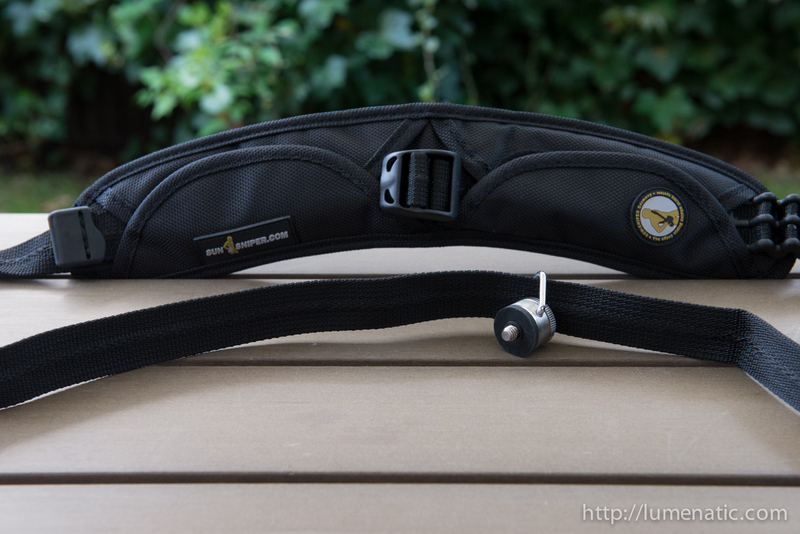 Both straps are of an excellent quality and offer a lot of carrying comfort even after hours. The construction on both straps is very similar with only small deviations. Needless to say there are more models out on the market, these are just two models out of many. Other models have a special curvature to be more practical for women, other models have additional securing straps for action photographs. Both the Blackrapid and the Sun Sniper are around 60 € each at the time this post is written. There are also cheaper models from other manufacturers. Whichever model you choose – don’t save at the wrong end. If your camera and precious lens crash to the ground because you are using a cheap strap with a poor build quality – does the price difference justify the damage ?